Dry heat provides relief for muscle and joint pain. 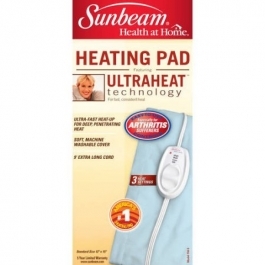 Your Sunbeam® heating pad is specially designed to fit a variety of areas.Provides consistent even heat. The product you buy may differ slightly from the one shown on this carton due to continuing product development. Do not return this product to the place of purchase. If you have any questions regarding this warranty, visit is on out website at sunbeamhealth.com. For household use only. Slip the cloth cover over the heating pad and snap it closed. Plug into a 110-volt outlet and set control to desired heat setting. For detailed instructions, see manual inside.